QR787 w/ Blind Bore - Quantum Devices, Inc. 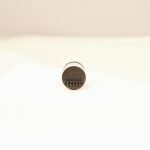 The blind hollow shaft version of Quantum Devices’ QR787 provides a high performance, high resolution digital feedback solution for small motor applications. 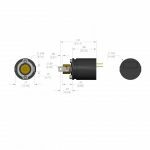 The QR787 model provides the resolution of larger encoder packages but in a package only 20mm (0.787″) in diameter. Outputs can be configured in either single ended, 5 volt RS422A differential or high voltage differential line driver. 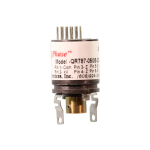 QDI’s patent pending sensing scheme embodies a much simplified encoder design, which ultimately results in longer life and less down time due to feedback device failure. The encoder housing is constructed of a carbon fiber composite that provides the EMI shielding of an all metal housing an performance of a lightweight robust assembly.